January | 2012 | I have to write something EVERYDAY?! As you can see from this snapshot I took while my kids were at recess, it was just lovely outside today. Well, truth be told, this is a picture from Yosemite National Park. But! it really was that beautiful outside today! It was sunny and 75 in the middle of winter. I’m sitting at home, enjoying the breeze coming through the open windows eating the strange concoction I cooked up after I got home. I decided to clean out the fridge and I ended up with onions cooked in sesame oil and broccoli. There is no need to take a photo. Just picture….onions cooked in sesame oil and broccoli. I can’t decide whether I would recommend it or not, but I’m eating it. My great aunt tried many experimental cooking recipes. My grandmother once asked her what she did with the duds. My great aunt replied, “I ate them too.” So that’s what I’m doing. But I know I’d rather have “clean-out-the-fridge” pasta more. I’ve reached the halfway point! Woohoo! No wonder I slept for, and I am not making this up, eleven and half hours last night! In language arts, we continued to learn about fairy/folk/tall/traditional tales and demonstrated our knowledge by creating our own traditional tales through a writing buffet. Students chose from a list of traditional beginnings to these stories, then chose a topic, and a traditional ending. Then they wrote their story. Many of them came out quite well. During our writing part, we finished up our first-person narrative and then shared with each other on Friday. Students put their book and a sheet of notebook paper on their desk. Then we all got up and danced to some music. When the music stopped, students had to find a desk (that was not theirs), read their friend’s book, and write a compliment on the notebook paper. We did it over and over again, so by the end, students had a book with eight compliments written about it! Munchkins gave it 3/3; we’ll do it again. In math, we are learned about comparing numbers. We started off with something very difficult: 1 more, 1 less, 10 more, 10 less. About half the students were snoozing mid-way through the lesson because they were so bored, while the other half was completely bewildered at how all these calculations were being done so quickly. I now know who gets number patterns in my class. Eventually we were able to move on to <, >, = and everyone was happy again. There will be a test next Thursday, though, and half my munchkins will NOT be excited to review. In social studies, we did very little since we were spending more than our fair share of time in math figuring out 1 more, 1 less, 10 more, 10 less. But eventually we got to learning about natural resources and students created pictures about natural resources found in Texas. In science, we finished up our unit on rocks and their usefulness (thank goodness!). Earth science is the subject in which I am least familiar, so I mostly had to follow whatever the book told me about rocks. On Friday, they were introduced to our new topic: conservation of resources. That will be next week. On the behavior front, I was having real struggles with a student. This student used to exhibit pretty aggressive and argumentative behaviors to everyone in the class (including me). However, in October we sort of hit a breakthrough and it’s been pretty good up til now. Due to a difficult change in family circumstances, I have seen the aggressive and argumentative behaviors come back. It felt like we were always getting into power struggles and I had no idea how to stop it. I knew that you shouldn’t engage in a power struggle, but I didn’t know how to avoid it. When the student refused to go to P.E., I couldn’t say, “OK, that’s fine” and walk away. I had to say, “No, you must come with us; I can’t leave you.” etc. Language Arts-We practiced reading, writing, listening and speaking. Science-We learned about the natural world. Social Studies- We learned about our interactions with the natural world. Ok, now that we got through that, we can talk about science fair. 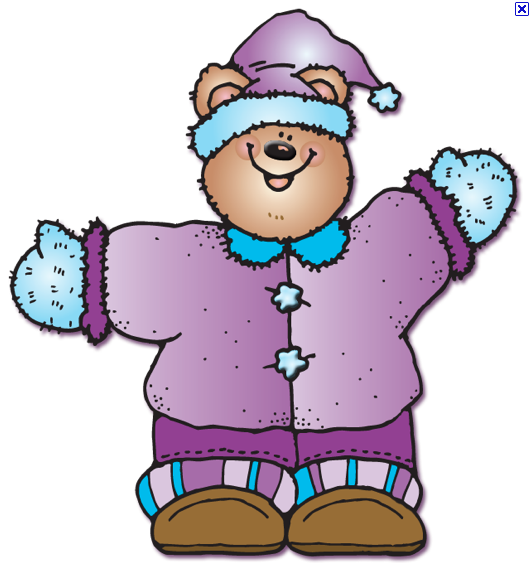 I sent out science fair information packets with the kids at the beginning of December. My thought was: this will give the kids a chance to complete the assignment over winter break. In my letter I stressed, using bold, italic and underline that this project was optional. Since parents have to do so much of the project at this stage of development, I didn’t want to hand the parents an assignment. It had to be a choice that the parents made. Then, in my weekly newsletter, I reminded parents of the date of the project and mentioned that it was optional, but that I would give extra credit to those students who chose to participate. A week before the fair, I asked students who was planning to participate and they all raised their hands. I thought, Great, half of these kids are in complete denial. Oh well. The day before the science fair, I asked students who was planning to participate in the science fair. about 2/3 of them raised their hand. I asked each one of them what their project was about and had they made a poster. Most of them indicated that they had but a few said that they were going to do it that night. I thought, Great, most of the unprepared kids realize that their not doing a project, but I still have a few who are in complete denial. Oh well. 1/2 the kids brought in a project. Just as I expected. They presented it and all did very well speaking to the judges. I was so proud of my munchkins! We had a pretty normal rest of the day until it was time for the awards show. 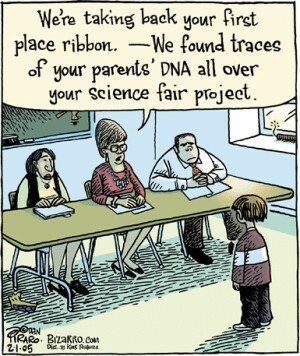 Each participant in the science fair got a certificate of participation in the classroom, but the awards show would hand out ribbons to the winners. 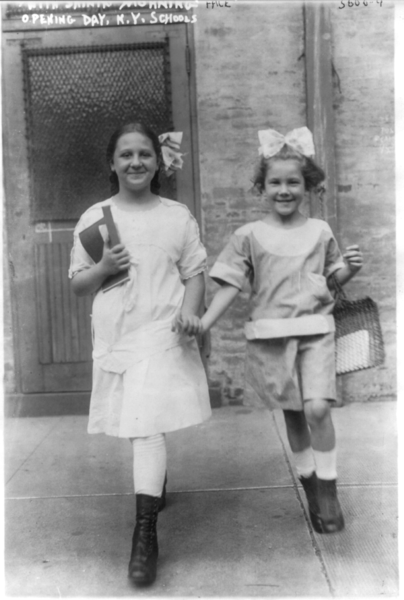 When first grade’s time came, two students were handed ribbons. Everyone clapped for them, but the non-winners seemed kind of stunned that they weren’t getting anything. Students who participated in the fair and were fine. Students who participated in the fair and were crying. Students who did not participate in the fair and were fine. Students who did not participate in the fair and were crying. We picked up our backpacks (Thankfully, I had them pack up before the awards ceremony or we would have never gotten out of there) and all walked outside. I watched the kids coming down, crying. And that was the topic of conversation on everybody’s lips: The first grade tear train; complete with kids who didn’t compete and were crying and those that did compete, and weren’t crying. So, Monday night was the South Carolina Republican debate. 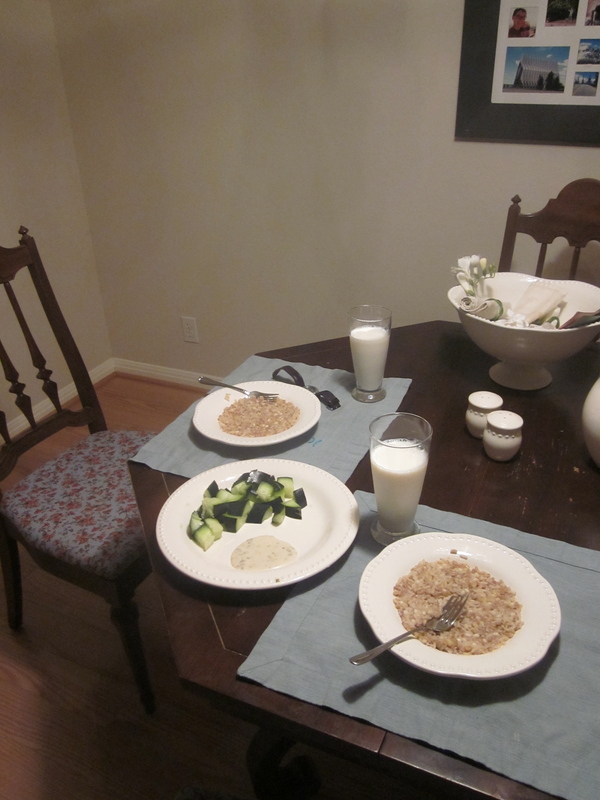 Jackson and I prepared for this debate by eating healthy food: 7 grains with a vegetable broth gravy and some vegetables. Why did we need to eat healthy for the debate? Well, it’s because we played a drinking eating game. We made banana and Nutella crepes and sat down to watch. 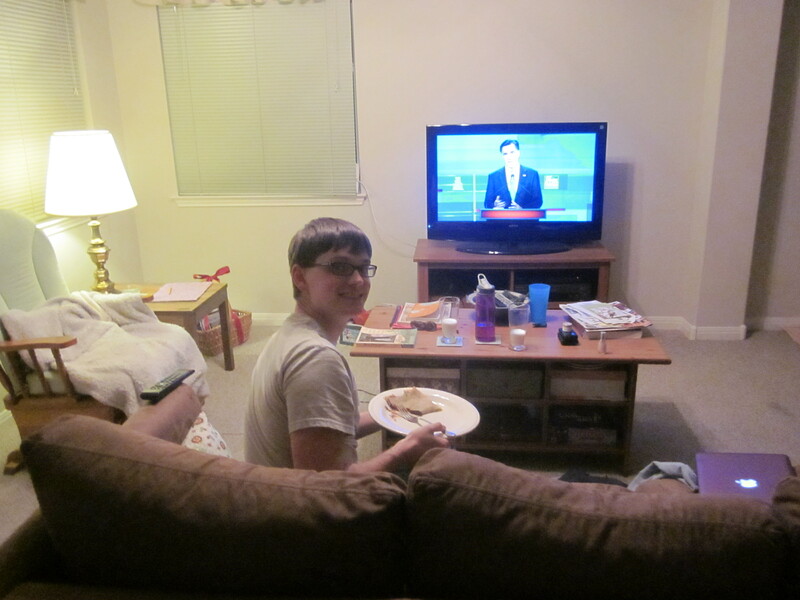 When a candidate said something that was just totally false or lame or despicable, we’d say, “THAT’S CREPE! !” and eat a bite of crepe. We limited ourselves to one crepe each since I didn’t want to write about us gaining 16 pounds. We ate our first bite of crepe before the debate even started and we were done with our crepes less than thirty minutes after the debate started. It was actually exciting to wait for someone to do/say something bone-headed. In language arts, we’re continuing with our Grammar Minutes, grammar exercises that my kids LOVE (I know, I don’t understand it either). It’s mostly focused on what the parts of a sentence are. We are also talking about the essential elements of a story: characters, setting, problem, and solution. The kids are doing really well with this activity. They’ll practice independently for the first time next week. In writing, we’re working on a personal story. The kids are doing an awesome job writing a lot. In math, we finished up number patterns after what seemed like eternity and a winter vacation. We’re working on place value now (4 tens and 6 ones = 46. Some kids immediately see the patterns and think this is the easiest thing in the world ( “because 4 is in the tens place and 6 is in the ones place!”). And some kids have no clue what is going on. They guess answer like 23 or 81. Hopefully these concepts will germinate in their brains over the long weekend and they’ll be ready for the next step on Tuesday. In science, we’re learned about water sources and how water is useful. Pretty easy stuff. In social studies, we worked on physical characteristics of place and human characteristics of place. Also pretty easy stuff. Oh well, sometimes things don’t have to be challenging. PK2: I’m a Muslim. But you’re a Christian. PK1: (hands on hips) Muslims use crayons too, you know! I get home significantly before Jack does, which is good because after a full day at school, I just enjoy being able to sit down without worrying that anyone will come up to me with a smiling, bleeding mouth and prized tooth in hand. Jack wouldn’t ask me to help him with a lost tooth, but he might demand my attention in another way like asking me how my day was. 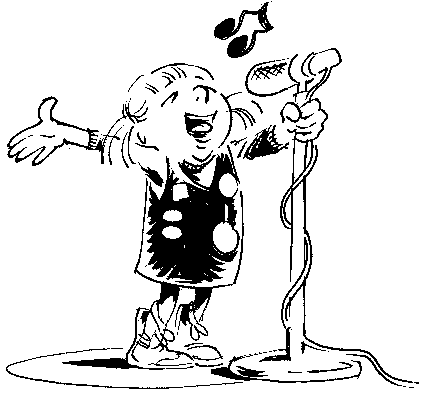 When I am alone, one of my favorite ways to unwind is to sing…loudly. And dance…dramatically. Jack and I have our own place, but our condo is in a duplex form and we have two wonderful neighbors (who look remarkably like Truman Capote and Kathy Bates actually) with whom we would like to maintain a good relationship. And we certainly don’t want them to think that we’re annoying…or crazy. That’s why I hope that they can’t hear my music or, heaven forbid, see me dancing like I’m trying work a piece of ice out of my clothes without using my hands. You see, I have one move: the twist, that I adapt to any song from “It’s so nice to be with you” by Gallery to “Livin’ on a Prayer” by Bon Jovi. I had no idea how to dance until I went on a party boat with my friends when I was a senior in high school. I felt sort of self conscious not knowing how to dance, so when the first song came on, and I promise I’m not making this up, I just started copying one of the parent chaperones. And she was doing the twist. Now, you might be asking, “Andrea, why didn’t you copy one of the many peers that were undoubtedly dancing on the boat?” That is a good question. And the answer is that I looked for the person having the most fun and it was the mom doing the twist. Our back yard is very shady thanks to two very large trees. One is in our back yard and the other is just across the fence in the lot of the Baptist church. 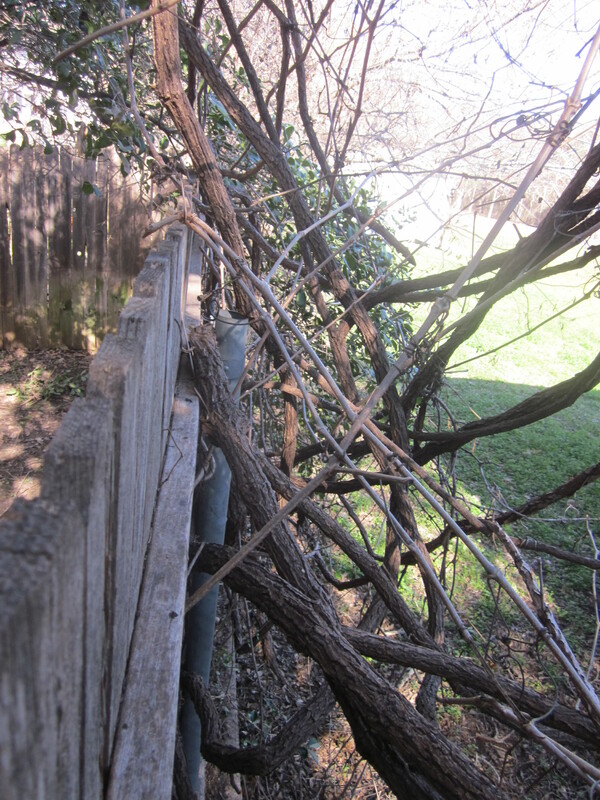 Also across the fence is a very very big grapevine. It is about four inches in diameter at its base, goes up for a few inches and then travels parallel along the fence for about 20 feet and then extends up. Lots of the vine is so thick that it has bark on it and it’s strangling the trees shading our yard. During the summer we tried to pull it down from our tree, but its leaves were entangled in the leaves of our tree and it wouldn’t come down. Now that it’s (sort of) winter, the leaves from the vine have fallen off. So yesterday we cut off a bunch of the vines which were on our tree and some of the vines on the church’s tree. After we cut the vines, we tried to pull them out of the tree, but lots of them were so entangled they wouldn’t come out. Andrea and I even hang on some of them. The vines are really ugly, so we probably need to get the vine completely removed at some point, but that will likely take a lot of work and a chain saw. It’s a really big vine.